When you have multiple Website Builder or InstantPage sites, you need to make sure that you select the right account. The place to do that is the My Products page. Log in to your GoDaddy account to open the My Products page. In the page's Website Builder/InstantPage section, select the account you want to open and click Manage. 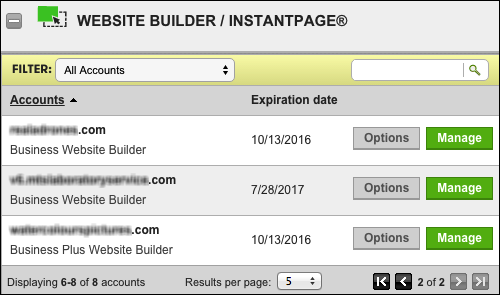 Note: The Website Builder/InstantPage section only displays five accounts at time, so you may need to click > to see the rest of your accounts.